oct 2 2013 Railway AGM, a photo by CadoganEnright on Flickr. 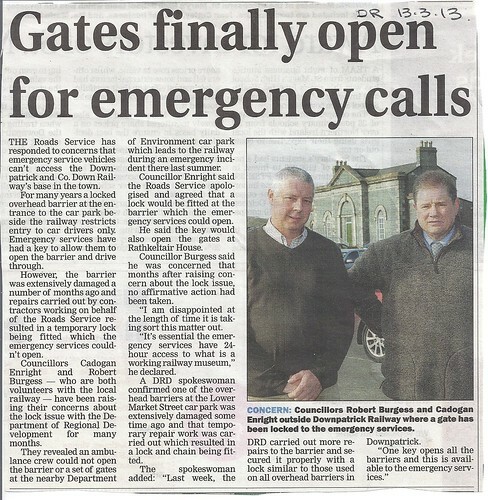 Despite repeated visits to Rathkelter House by Cllr Enright – for more than a year the Roads Service has left a non-standard lock on the car park for Down Railway – creating a blockage for access by the Ambulance Service or other emergency services. 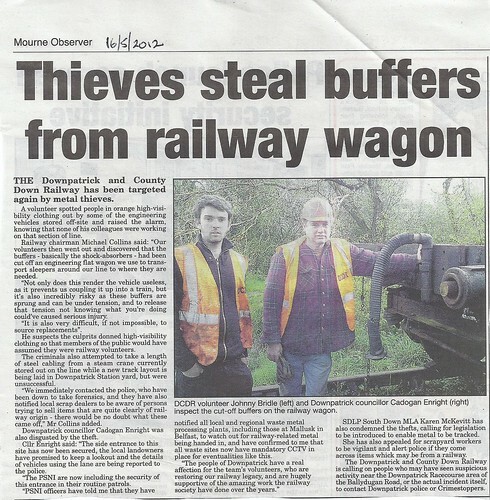 Delays in access affected a prominent ex-member of the railway who had a heart condition. Councillors Cadogan Enright and Robert Burgess are threatening prosecutions on people who park up at Down Railway in the evenings and throw out fast food wrappings and drink cartons at one of Downs premier tourist attractions. “There is going to be a crack-down”, said Cllr Burgess, “offenders will not be hard to trace as we will have their car registration numbers, so I would urge anyone who is thinking of driving into Downpatrick for a takeaway – to keep their rubbish until they get home or use one of the many Council-provided bins around the town”. 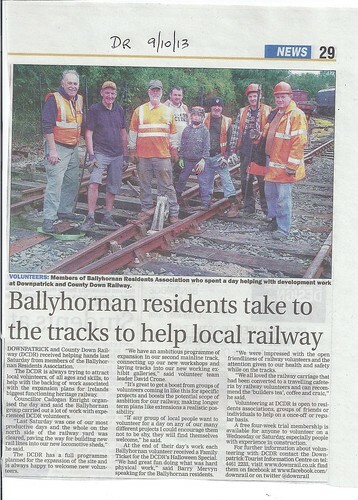 The Council, railway volunteers, the lottery and many government agencies have worked to deliver what is N.Irelands only working heritage railway. It has greatly expanded in the last year, with a huge new carriage museum, workshops and is in the throes of re-laying much of its existing tracks before its next big event on St Patricks day. This will make room for rapid expansion at a later date. A new entrance area is also being constructed to what is a working museum, and one of the jewels of Downpatrick. railway metal stolen down recorder, a photo by CadoganEnright on Flickr. Downpatrick cut-off and under water? Downpatrick and Lecale Councillor Cadogan Enright attended the launch of the new town Master plan last week. Cllr Cadogan Enright said “There are some excellent points in the plan like the acceptance that “in-town” shopping needs to be developed around the bus-station, and that the proposed ring-road needs to go around the east and the south of the town. I have campaigned for these points in the past to ensure the sustainable development of the town going forward. It is essential that our infrastructure is developed to allow us to be one of the towns where public sector jobs can be outsourced. We have been ruled out as not meeting the criteria for decentralisation of jobs as we stand”. “The plan envisages building on half the flood-plain and flooding the other half and reclaiming a large part of Downpatrick Marsh for sports fields. This will potentially expose the town to great danger in the future. Downpatrick is already the lowest-lying town in Ireland with the centre almost half a meter below sea-level. Removing the flood-plain is a really bad idea, and professional planners should know better”, said councillor Enright. “The Town seems to be in the process of losing its direct bus connections to Dublin and Dublin Airport with hardly a comment. These have one of the greatest concentrations of Tourist traffic in Western Europe. The seven million tourists who arrive at these locations annually are exactly the sort of Tourist that would be drawn to “St Patrick”, “The Mountains of Mourne” or any of our outdoor attractions”, said Cllr Enright. 1. 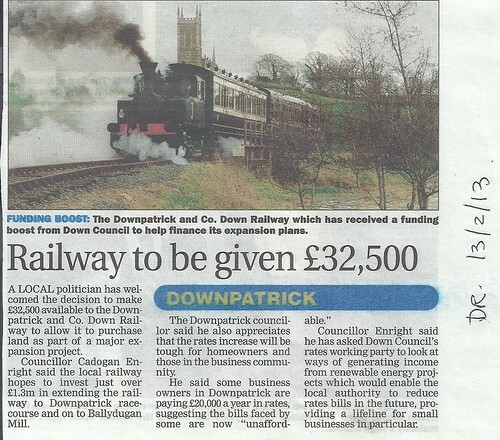 The railway society secured lottery funding for the new link to the St Patrick’s centre, and this is shown in the Master Plan – but the council has inexplicably gone cold on this idea since the SDLP voted against it and the Railway society was forced to return the money to the National Lottery. 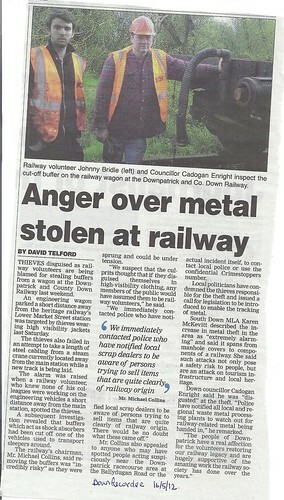 If we show the link, then we need to support the Railway society in achieving it. 2. Northern Ireland Water seems determined to put their new sewerage pumping station in the middle od the car-park at the back of the post-office, if they do this the plan for the in-town shopping centre will be stymied. I have repeatedly brought this up at the Downpatrick area meetings and have had cross party support – but NI Water persist with the proposal. 3. There are no timelines pencilled into the plan, with no figures calculated even in draft, and vague references to short-term, medium-term and long-term for which no definitions exist within the report. If the plan is to happen it needs to be believable.